⚔ Den Fælles forsvarsfacilitet i Pine Gap. Amerikansk, australsk efterretningssbase i Australien oprettet i 1970 under den første del af den kolde krig. Fra 2003 del af USAs raketskjold, rumimperialisme. 'As noted in the Pine Gap Treaty (Australian Treaty Series 1966 No. 17, amended by Australian Treaty Series 1988 No. 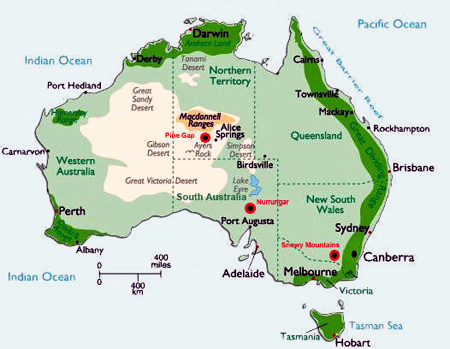 36), the cooperating partners at the Joint Defence Facility are the Australian Department of Defence and the US Department of Defense. Details of the specific agencies involved are classified'. The US Defence Support Program ' is the U.S. military's early warning system for the detection of long range ballistic missile launches and nuclear detonations. The system uses a constellation of geosynchronous DSP satellites to provide continual coverage. Initially begun in 1970, over 19 (?) DSP satellites have been launched. The satellite bus and instrument payload have been improved over the years resulting in 3 different DSP variants. DSP satellites were used during the Persian Gulf War to detect Iraqi Scud missile launches. The DSP system is controlled from Scott AFB, Missouri, with stations at Guam Island, Pine Gap, Australia, and Nurrangar, Australia. Another issue (and one that resonated well in Australia) was the secrecy surrounding the project. Gough Whitlam, the head of the labor party, raised this point in parliament, asserting that while it was right for Australia to cooperate with the united States, it was wrong for the Australian government to withhold information on the project from parliament and the public', Societal impact of Spaceflight s. 379-380 - http://history.nasa.gov/sp4801-part1.pdf. 'In 1978, President Jimmy Carter acknowledged that the U.S. employed reconnaissance satellites to collect imagery of foreign targets. Early in 1995, President Clinton declassified details concerning early satellite imagery programs such as CORONA. However, even the existence of SIGINT satellites remained classified until late 1995 when Director of Central Intelligence John Deutch authorized the official acknowledgement of space-based SIGINT operations. The process involved soliciting the opinions of U.S. government departments whose interests might be affected by disclosure. The State Department's memo expressed concern about the impact in certain countries. Despite the deletions, it is clear that the department was anxious about the impact in the foreign countries where the U.S. operates ground stations for SIGINT satellites—the United Kingdom (at Menwith Hill), Germany (at Bad Aibling), and Australia (at Pine Gap). The memo also indicates that the proposal for declassification emanated from the National Reconnaissance Office. ' The National Security Agency Declassified:Internet wiretapping mixes "protected" and targeted messages, Info Age requires rethinking 4th Amendment limits and policies. National Security Agency told Bush administration "Transition 2001" report released through FOIA, Highlights collection of declassified NSA documents Posted on Web by the National Security Archive. National Security Archive Electronic Briefing Book No. 24. / Edited by Jeffrey Richelson Originally Posted - January 13, 2000. Updated - March 11, 2005. Se også: Amerikanske efterretningstjenester ; Australien: Efterretningstjenester ; New Zealand: Efterretningstjenester Storbritannien: Efterretningstjenester. Australian Treaty Series 1966 No 17: Department of External Affairs, Canberra: Agreement between the Government of the Commonwealth of Australia and the Government of the United States of America relating to the Establishment of a Joint Defence Space Research Facility [Pine Gap, NT] (Canberra, 9 December 1966) Entry into force: 9 December 1966. Australian Treaty Series 1966 No. 17. Australian Government Publishing Service, Canberra. Ball, Desmond : Pine Gab : Australia and the US geostationary signals intelligence satellite program. - Sydney : Allen & Unwin, 1888. - 121 s. : ill. - ISBN 0-04-303002-5. Testimony of Professor Desmond Ball to the Joint Standing Committee On Treaties, Reference: Pine Gap, Official Committee Hansard, Parliament of the Commonwealth of Australia, Parliament of the Commonwealth of Australia, 9 August 1999, pp 1-16. 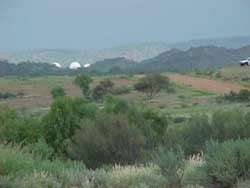 I: Report 26: An Agreement to extend the period of operation of the Joint Defence Facility at Pine Gap. Joint Standing Committee on Treaties October 1999. - 41 s.